So much of the enjoyment of a ski holiday is in stopping off in a cosy mountain hut to enjoy a delicious lunch, to rest tired legs and refuel for an afternoon of fantastic skiing, so we asked our knowledgeable resort teams to recommend our clients’ favourite mountain restaurants in some of our key resorts. Some are quirky and a bit off the wall, some are quaint and traditional, some offer cutting-edge cuisine, all offer the very best quality. If you're looking for an unusual dining experience without losing any of the cosy and warm atmosphere of a mountain restaurant, look no further than La Vacca. This restaurant is set at the bottom of a valley, making it easily accessible by both red and blue runs, or simply on foot by catching a bubble lift up from Flims town - meaning nobody has to miss out on this incredible dining experience. The restaurant is instantly noticeable as you approach. It's not very often that you find a tepee in the mountains! As you step inside, you'll be surprised by how much larger it is than it first appears. Booth-style tables draped with warming blankets line the perimeter of the tent, with room for around sixty people, all surrounding the magnificent floating fire-pit in the centre (the perfect place to let your gloves warm up over lunch, ready to set off again after lunch). The menu is all about the mouth-watering steaks, accompanied by baked potatoes, garlic bread, sour cream and various flavours of butter, and perfectly paired with a beautifully robust Argentinian Malbec, a firm favourite with Powder Byrne guests! A strange name for a mountain restaurant, don't you think? Das Elephant is located at Crap Masegn, situated at 2475 metres above sea level. On a sunny day, it’s an exceptional place for a visit. The view from the terrace truly makes you feel like you're on top of the world, with the Gräuberg mountains tinted in an incredible array of blue hues. Das Elephant is famed for its penne pasta with truffle, tossed in front of you in a giant hollowed out wheel of parmesan. But why the name, Das Elephant? In the summer of 1992, a circus came to Crap Sogn Gion, and with it was an elephant who had the fortune of enjoying the breath-taking view from Crap Masegn each day, and the restaurant was subsequently named in its honour. This restaurant is loved by Powder Byrne guests, and once you experience it for yourself you'll be sure to understand why! One of our clients' favourites, Motta was renovated over the summer and it really looks amazing. There’s a lovely indoor seating area with a big fire in the middle, as well as a huge sun terrace with an outdoor bar for sunny days with lots of comfy seating. All the food is really delicious and the ribs come highly recommended, as well as their very good veal sausage and yummy salads. Their wine selection is also very impressive. On the Arosa side, Hornlihutte is one of the best I’ve been to. It’s right at the top of the peaks so the views are great and there’s also a beautiful outdoor area for when it’s warm enough. When it comes to the menu, lasagne is their speciality. They cook it fresh daily and serve it at the table directly from the stoneware dish in which it is cooked. On sunny days, they also have a barbeque out on the deck with delicious ribs and chicken. These three dishes (ribs, chicken and lasagne) are so popular that they use coloured flags to indicate if the food is still available. When they take one of the flags down, it means they have run out of that particular dish so go early if possible so you don't miss out! 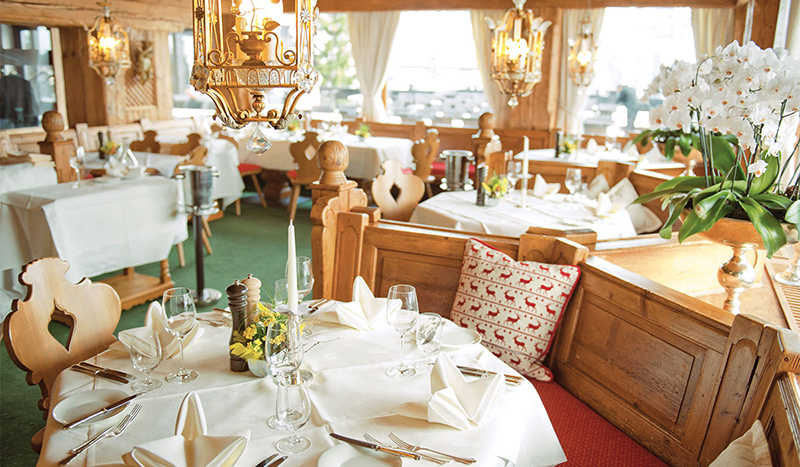 Also on the Arosa side, Scharmoin Restaurant is best known for its variety of Bratwurst dishes and specialities from the grill, as well as other traditional Swiss delights. It's also a great spot for some festive apres ski! Nestled in the small village of St Christoph, just below the high Arlberg Pass, the 700 year old Hospiz Alm offers a truly unique mountain restaurant experience. The restaurant itself doesn’t look like it's changed in centuries with its traditional charm and the huge central open fire. No visit to the Hospiz Alm is complete without sampling the delicious spare ribs, reputed to be the best in Austria. However, the real attraction of the Hospiz Alm is the wine list, which is extensive to say the least. Ask the brilliant Head Barman, Karl Heinz to show you around the wine cellar to select your bottle or simply to marvel at the cellar's size. It is the largest ‘big bottle’ cellar in the Alps and contains many vintages which cannot be found anywhere else in the world, the most expensive of which costs over €85,000. Large bottles of wine are reported to age slower and have a different taste to standard sized bottles of wine, which is why they've built up such a vast collection at the Hospiz Alm. The Burg is one of the best hotels in the Arlberg and dominates the left side of the blue run through car-free Oberlech. Visiting the hotel’s restaurant is an absolute must during any skiing holiday in Lech and Zürs, especially on a sunny day when the huge sun terrace is open, allowing guests to take in views of the Rüfikopf on the other side of the valley while skiers glide past on their way to Lech. The headwaiter, Hermann will recommend culinary highlights such as the truffled pork and the excellent Wiener schnitzel. If you have room for dessert, do try what is considered to be the best Kaiserschamarren in Lech. Kaiserschamarren is a traditional Austrian pudding consisting of shredded pancakes and stewed plums, dusted with icing sugar and served in a large pan to share. If, after a long lunch, you don’t feel like skiing home, don’t worry; the cable car back down to Lech runs from just outside the hotel! 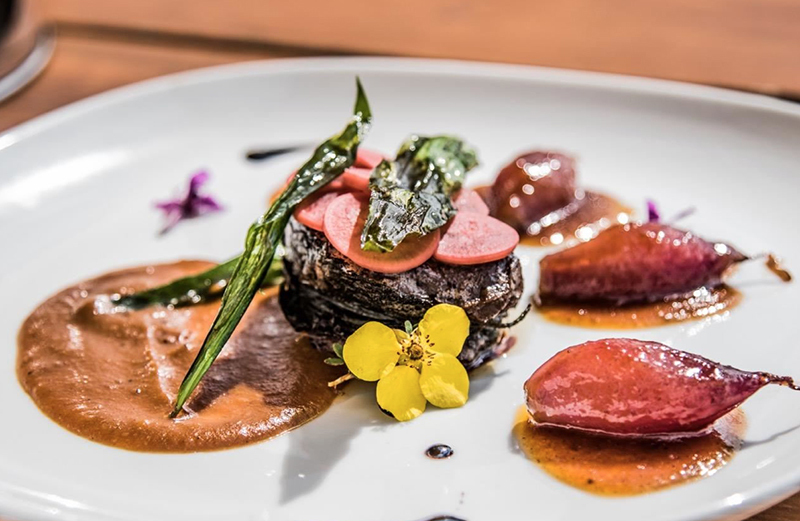 With six Michelin stars in one gorgeous village, San Cassiano is a foodie's delight, so it's no surprise that the mountain dining is very special too. Recently refurbished Piz Arlara has a lovely terrace and large windows to make the most of the panoramic views of the Dolomitic peaks. The menu includes local specialities and traditional dishes, as well as Mediterranean treats, all made using the finest, freshest ingredients. The deserts are so good, it’s worth a visit for those alone! The shelter has a large sunny terrace with bar and restaurant. Here you can enjoy aperitifs, simple dishes, Ladin, Tyrolean and Mediterranean cuisine, homemade desserts, and a great selection of wines. To find out more about a ski trip to make the most of this season’s fantastic snow conditions and experience some of the best mountain gastronomy, call 020 8246 5300 to speak to one of our knowledgeable Travel Consultants or click here.